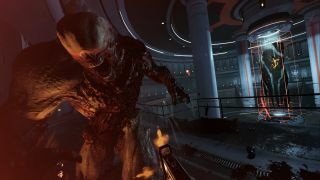 Last year’s Doom turned out to be one of the finest shooters of the generation and thrust the long-running franchise back into the mix of gaming’s elite after an all-too-long absence. Blisteringly fast movement, waves of relentless enemies attacking from all angles, and a fine selection of weaponry blended together for the perfect hellevator experience. All of that makes Doom an exciting prospect for virtual reality. As a Doom fan and PlayStation VR early adopter (aka a Sony glutton) I was naturally ready to dive in face first. But think about it for a second. Doom is a seriously fast game. You’d struggle to find a more intense shooter experience in gaming and its super slick frame rate, even on consoles, is a huge part of what makes it so enjoyable. Can today’s virtual reality headsets cope with that same speed while keeping the resolution in check? And even if the tech is able to hold up its end of the bargain, are gamers themselves ready? From what I’ve experienced on PSVR since launch, I’d have to say no. Not yet. Frame rate drops and juddering images are major concerns in virtual reality FPS titles, not just because they break immersion, but because they're among the biggest contributors to motion sickness. Add in the constant movement required for taking on Doom’s demons and you’ve got a recipe for green gills all round. The technology needs to be capable of providing frame rates as buttery smooth as non-VR titles. Even the display resolutions in the current iterations of the PSVR, Oculus Rift and HTC Vive headsets seems to be lacking. And let’s not forget, gamers in general are still getting used to the experience of playing in VR, with early adopters commonly complaining about the nauseating side effects some games inflict. It's likely we'll be waiting until the next generation of headsets for any widespread improvements in these key areas. So while the technology, developers and gamers all take the time to get more used to VR, we perhaps need to change our expectations of what it can provide. Not that we shouldn’t have hopes – VR has been the Promised Land for future-gazing gamers for years now. Thankfully, it would seem Bethesda and id software are aware of the problems around VR and have tried to strike a happy medium, while still playing up to VR’s strengths. Instead of simply strapping on your VR headset, using a regular controller and running the risk of the aforementioned problems, you’ll be taking advantage of new motion-controls to dive deeper in Doom’s world like never before. During my Doom VFR hands-on demo on PS4 I used two PlayStation Move controllers. Thankfully, I was brought up to speed on how to use these via a series of brief training rooms, rather than dropped directly into the hellspawn’s warm yet bitey embrace. The biggest change Doom VFR makes is the use of teleportation to move around the levels. Simply hold down the Move button on the left controller and an aiming arc appears, landing on wherever you point your left hand. Release the button and you’ll zoom on over. It’s super responsive and fast, allowing you to move around areas with ease and even teleport up onto platforms and ledges. The face buttons on the controller can be used to dash backwards or to the sides and turn 180 degrees too, with that last one making a huge difference once I’d found the button – just why are the face buttons so damn small on a Move controller? While undeniably a very different from the movement mechanics in Doom 2016, once you get going the system is surprisingly agile and I was able to dominate the arena and zip around in style. Teleportation in Doom VFR allows you to gain the higher ground or create space much faster than traditional controls and the face button dodges are super handy for avoiding enemy fire without compromising your overall position. The Move controller is excellent for aiming weapons too and it’s incredibly empowering wielding the mighty Doom shotgun one-handed. And let’s not forget, you don’t have to fully look where you’re shooting as you can simply aim straight out to the side at 90 degrees to take out enemies you can see at the edge of your vision. Imagine combining Equilibrium’s too cool to look while aiming with Doom’s boomsticks. It's hard not to have fun playing Doom VFR. First person shooters and VR seem like a perfect fit, but something has to give to make the pairing really work. If we just have the standard controller inputs, then aside from head-tracking aiming (which is far from perfect in any other FPS titles at this stage) it’s barely more than a novelty. Throw in motion-controls, though, and Doom VFR offers something verifiably different from the regular experience and that’s what developers should be aspiring to rather than just throwing in head-tracking to an existing experience. Let’s not forget, Doom VFR is a standalone experience and a new game with some fresh levels rather than a firmware update. Though it's reportedly only around four hours long, that seems like a reasonable compromise to ease new VR players in. Not to mention the game will only cost around $30/£18/AU $69 as Bethesda already knows gamers have heavily invested in a serious expense in PlayStation VR, or a VR-capable rig. As much as I’d love the full-on Doom experience in VR, the displays on current virtual reality headsets aren't quite where they need to be and consoles and most gaming PCs just aren't powerful enough to allow these headsets to match the super smooth performance of the standard game. To push things too hard too soon is going to leave most gamers staggering rather than walking away from their experience and when you consider how much money players are being asked to invest in VR, that’s a risk developers shouldn’t be too eager to take yet. I seriously hope VR is here to stay, but we’re not going to get everything we want straight away; especially given it’s still effectively a new medium. As for Doom VFR, this feels like a step in the right direction and shows a dev team understanding the pros and cons of virtual reality’s current capabilities. Doom VFR is a different Doom than what we're used to, but it's still a deadly VR experience and it has the potential to be one of this year’s PlayStation VR highlights when it releases December 1.